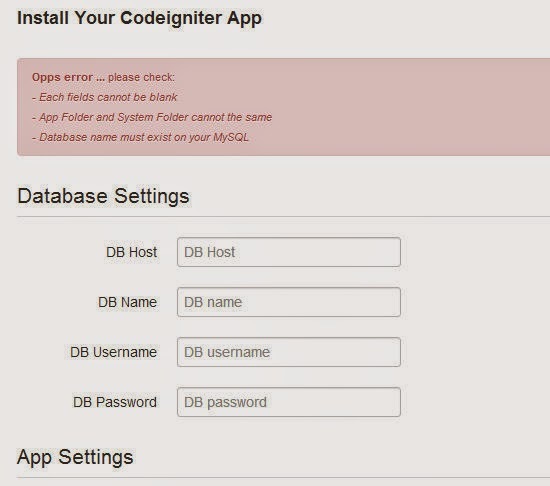 In this article, we are going to discuss about How to develop a web installer for a CodeIgniter (CI) application. When you installing a CMS on your server, usually you need to find a form for setting up your database settings, admin user credentials, SMTP details..etc. This option can be found on popular open source CMS by default. This article might help after you finish create your own custom web project and don't want to make confuse your client with manual install by editing php file. Create a file named "MY_Install.php" on your codeigniter application library, I assume we have a default codeigniter database setting, so this script will check if database name are blank we can continue on installation, by redirecting the page to install folder. After an install folder is created, create an index file which consists of form script for database setting and php script for replacing the default codeigniter settings. That's all after the installation finish it will redirect to index page again and ask you to rename or remove install folder, you can add more validation by yourself or even other settings for common web application, below are the example screenshot.